So many of you Weeklybeaters are such proficient audio mixers, oh how I envy you all. Played some lead guitar on this one. Made me feel good inside. This is what happens when you have the house to yourself to record guitar solos. great guitarplaying and drumming. You know exactly what you are doing. I envy you. Yeah, that organ adds a really nice touch and there's some wicked guitar work on display. 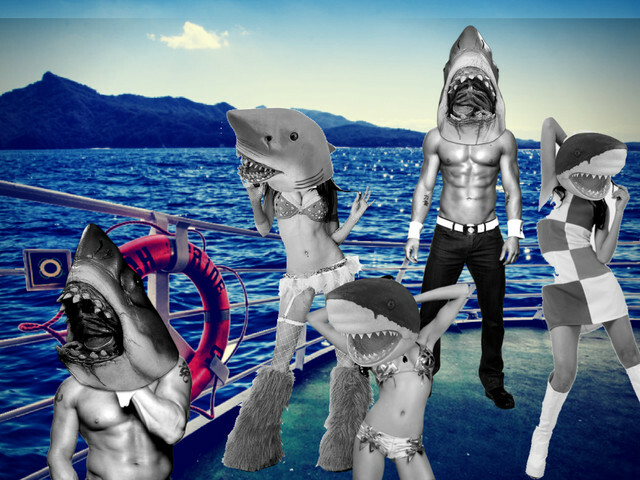 This seems like THE shark social event of the year. I'm going to play this while I grill later. Friggin great job. Everything fits so well. The shark event indeed! Fun party this was, dig the organ. Marvelous lead guitar. And i just can agree with the others the organ on this one is especially nice! Your arrangements and mixes are so well done every week. You could release only your wb tracks as an album. Marvelous lead guitar. And i just can agree with the others the organ on this one is especially nice! Your arrangements and mixes are so well done every week. You could release only your wb tracks as an album. Respect! Oh my days this is SO GOOD! How did you do the drums????????????? So inspiring and makes me want to drive my car into the ocean! YEAH! PARTY ON! Oh my days this is SO GOOD! How did you do the drums????????????? I don't know about you but I think you did a great job of mixing. And your track art fits the song perfectly. I promise you before 2019 I am going to do some S U R F R O C K So inspiring and makes me want to drive my car into the ocean! YEAH! PARTY ON! I wish I could join that party, but my body isn't nearly as great and also I have a human head. Great instrumentation here dude. Mixing is just what people do to cover their lack of everything else, you're fine without it. I wish I could join that party, but my body isn't nearly as great and also I have a human head. Great instrumentation here dude. Mixing is just what people do to cover their lack of everything else, you're fine without it.